We need more community groups to help us transform lives! Read all about our newly formed North Northumberland and Scottish Borders community group and find out how you can get involved in local community support. In 2013, Susan Fulton’s life was transformed when she was partnered with canine partner Esther the poodle. The pair live in Lowick, Northumberland where our presence as a charity was not well known. After answering numerous people’s questions about Esther wherever she went, Susan came to us in need of more information that she could pass on to those interested in what our amazing dogs are capable of. 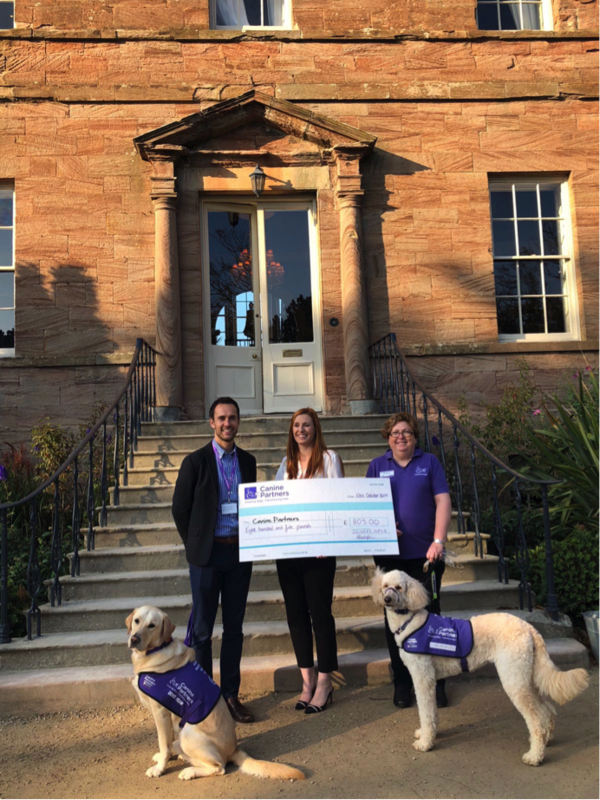 Our awareness team encouraged her to become a speaker for the charity so she could deliver talks about our work and a first-hand account of the significant difference a canine partner can make. Susan injured her back over 20 years ago, and due to scar tissue on her spinal cord she is in constant pain and her back is at risk of going when doing simple tasks that many of us take for granted. Esther is able to lend a helping paw with tasks that include retrieving dropped items, loading the washing machine and much more. But when Susan’s back is particularly bad, she often has to stay at home with Esther and rest. Luckily, in September 2017, puppy parent and fundraiser Marjorie Johnston moved to Newton-by-the Sea – just 20 minutes away from Susan. 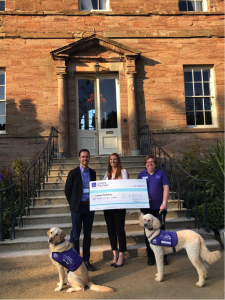 Marjorie was able to help shoulder the work, and with a lot of experience in fundraising for us already, she set up the Northumberland community group which now holds regular community events to raise awareness and funds for Canine Partners. 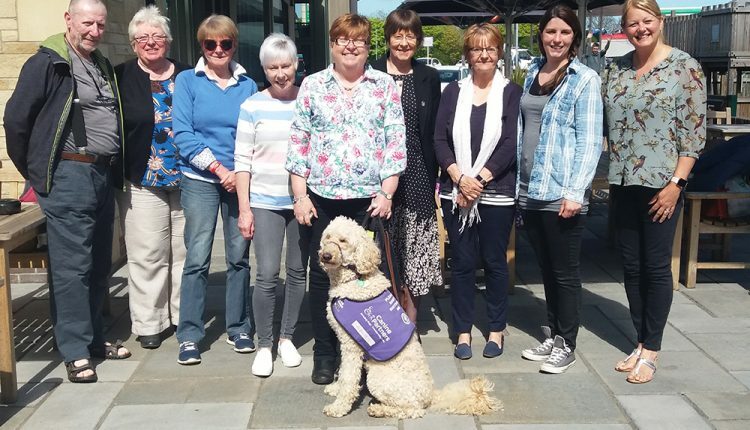 “I’ve been involved with Canine Partners for around six years now, and have taken four puppies through to advanced training as well as helping with fundraising in Scotland where I previously lived.” said Marjorie. The group have exciting plans to establish themselves in the area, having officially launched in October 2018 at an awareness day at Newton Hall in conjunction with fundraising by its sister venue The Joiners Arms with 120 people attending. The Group will continue with awareness and fundraising events in 2019 and have been fortunate enough to be made Dunstanburgh Castle Golf Club’s Captain’s Charity of the Year. Could you form your own community group in your local area? In order to help generate more awareness and funds to reopen our waiting list and help transform the lives of people with disabilities, we need more community groups to form across the country. 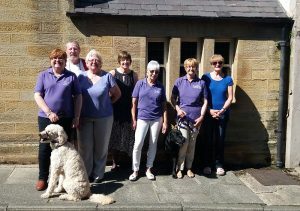 Community groups organise events in their local area to represent Canine Partners and showcase the work that we do. This can involve holding a stall at a local event, hosting coffee mornings and much more. To find out if there is a local community group in your area, or to set up your own, visit our Local community group page and fill in the enquiry form to express your interest.